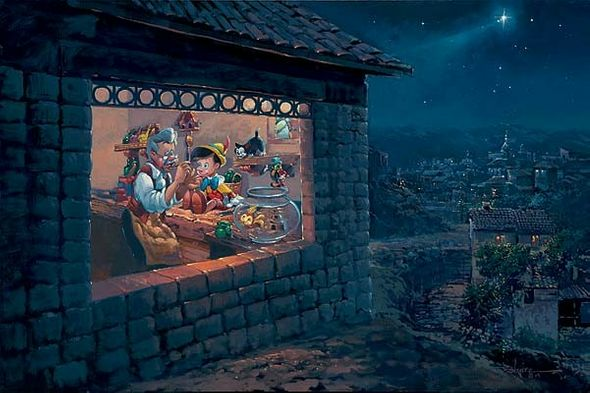 Rodel Gonzalez Limited Edition Giclee on Canvas:"The Wishing Star - Pinocchio"
About the Artist:Rodel Gonzalez is an artist of inspirational talents with a keen eye for seeing the beauty in the commonplace and grace in the ordinary. His story starts with an initiation into the art business through the tutelage of his father, Rick Gonzalez and grandfather, Felix Gonzalez, at the age of 9. "Growing up my father would always tells me to not be intimidated by the paint and be 100 % sure about my intentions on my first stroke at the canvas" says Rodel. His explorations of color, form, and composition ignited a lifelong passion for the arts in its many forms. His artistry became evident in the field of music and at 20 he founded ""Side A"" in the Philippines. The band is still active today and is currently the longest-lived band in Manila. Rodel was the lead singer and the band's most prolific songwriter. His success in the music industry fulfilled a part of him, but exposed a desire for a more meaningful and deeper connection with his audience. When asked about his latest works for the Disney Fine Art portfolio, Rodel has said, "Having the opportunity to create Disney paintings is such a treat because Disney was definitely part of my childhood. I remember watching my first Disney films ""Bambi"" and ""Snow White"" and ever since I've been mesmerized by the succeeding Disney movies I've seen. I believe a painting is a mirror of the painter's understanding of an insight he has. The Disney paintings each involved such a strong concept that every brushstroke was a joyful anticipation of the finished product. The energy was very strong therefore my intentions were sure and refined. I would say that there was a lot of grace present on every painting"."